is apple obsoleting the mini? Last week I was looking at computer configurations and it just seemed the iMacs were a little stale. It's all Rich's fault really because he got excited about StarCraft II and so I was poking around recommended specs and things like that. My MacBook is great, and I've really been laptop first ever since my iBook, but you do compromise on graphics and RAM especially with a low end laptop. Well, it turned out Apple thought the iMac line dated too, as they revamped the whole desktop Mac product line. But the Mini revamp leaves me scratching my head. In an era where most of the 'major' leaps in PC computing power are behind us, it latches onto another selling point - its compact size. It also addresses the planned obsolescence problem: if you buy an all-in-one computer in the flat screen era, the monitor stays decent longer than the system, creating a fixed cost that lengthens the amount of time you're attached to the system (and the keyboard and mice issue affects most unattached systems, too). The Mini allows you to replace the whole system during the life of the monitor and peripherals, or even operate without a monitor. Unlike HP and Dell, Apple doesn't offer a low end tower system. 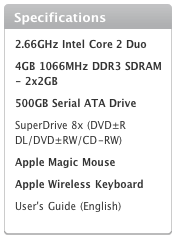 So this iteration of the iMac line seems like a really good value. The base level system with a 21.5 inch monitor is a 3 GHz Core i3 with 4GB RAM, 500 GB HDD, and Radeon 4670 graphics card for $1,200. If you like playing the instant rebate game, HP and Dell have exciting websites to navigate, although at the moment, it seems like Dell is mainly interested in pushing either the lower end Celeron and Pentium chips, or the i7. They don't seem to have much of the i3 variety yet to peruse. At first glance, the new Mini is significantly cheaper at $700 vs $1200. But I think this vanishes astonishingly quickly when one looks at the difference. There's a lot of stuff the Mini doesn't have - a monitor, stereo speakers, webcam, microphone, wireless mouse and keyboard being the most obvious. We could approximate that at roughly $300, which is over half the gap right there. But worse, the Mini has noticeably inferior technical specs in its core system. It has a 2.4 GHz Core 2 Duo, representing both much lower clock speed and an older generation of chips. It has a 320 GB HDD that is both smaller and slower. It has 2 GB RAM, which is both half as much as the iMac and also slower. It has an integrated video card instead of the discrete graphics in the iMac. you have a better system, but one that is still inferior to the iMac. Yet it costs just $12 less. Try buying a monitor from Apple for that. I really like the concept of the Mini. But if Apple is going to create such extreme price/performance gaps, I wonder if they've decided it's not as cool a business strategy as it is a concept. I was thinking of getting a Mini as my next computer purchase. That has now been put on hold, and I'm not sure where to go next. If I were doing marketing for Apple, I'd suggest strongly that the price and product aspects be revisited - unless the purpose is to phase it out slowly, which I think this might do gracefully. Here's what I'd like to see instead: three models, instead of two. You do the inexpensive one at $599, perhaps cutting back on the hard drive and the processor if that cuts too deeply into margins (for example, a 2 GHz C2 Duo and 160 GB HDD). Then you add a $799 model with, say, a 3 GHz core i3, 4GB RAM (1066 MHz), and discrete video card. This still lets the low end iMac be better with the faster RAM and a bigger and faster hard drive while rendering a value Mini at this price point. Then you keep the third Mini option at $999 which is the server version. So the business gamble Apple presents is something like this. I might get a new iMac, which is a little bit more computer than I need in that I have a TV/monitor and keyboard/trackball currently. However, I might also not do anything at all this year. Essentially, Apple is jeopardizing $600 - 800 worth of sales, my future interest in the Mini line, and the likelihood of my next computer purchase being within the next three years (as I'd keep the iMac longer than the Mini), all in exchange to get me to pony up another $400 now. Or maybe it's just really expensive to cram this new stuff into the Mini, and Apple's marketing team is running into the problem that 'small form factor' and 'inexpensive consumer machine' are becoming more conflicting than complimentary. (P/R) For the sake of all that is rational and sane, I feel the need to make a blanket statement that shows no mercy or compassion for concepts like nuance and shades of gray. If you voted for the war supplemental - ie, money above and beyond the massively bloated amount of money already allocated to military excursions - you have zero credibility on fiscal responsibility. I don't want to hear you utter one word about deficits or debt. I don't want a peep about how Social Security will go bankrupt in a gazillion years or how the richest country in the history of the world can't afford healthcare for its citizens or how rich people paying the lowest taxes in the developed world pay too much in taxes. *Of course, you've probably had slim-to-none credibility as is. But this vote helpfully renders the number a precise zero. Stop talking about the deficit. Everybody knows it's irrelevant. Even you. If you like Matt Damon and action movies, definitely rent Green Zone. I think it's slightly more suspense/less close violence than the Bourne series, but it's very similar. It's creepier to the extent that there's nothing magic or special. Damon isn't a superhero; nobody is. To the extent that 'facts' are now 'politicized' (ie, that the Bush Administration lied about WMDs in Iraq should be about as controversial as the notion that the Earth orbits the sun), the movie certainly is political, but there's very little actual politicizing in the movie. There's all of about 90 seconds of dialogue sermonizing on the bigger picture. The other 90 minutes it's an action movie with fictional characters pursuing a fictional plot. And some of the fictionalization makes The Powers That Be look better, not worse, than reality might warrant. The reporter is actually investigating deeper into the story, questioning what is going on. The CIA is impressively nimble, and the notion that there aren't WMDs is treated innocently, as if no one would have contemplated it. The civilian administrators talk a lot about democracy and building Iraq, while magically never uttering that little word we hear so much about in real life. I'll let you guess which word that might be. But the creepiness, it's all around. This thing might just as well have been a documentary. What difference would it make? We have so successfully blended fantasy and reality that maybe there's no meaningful distinction to be made. And really, what's it matter? The movie ends and you go on about life. You know, if you're not, like, one of the characters stuck in the story. but Ross Douthat just wrote a fairly insightful and stimulating piece. Douthat is the conservative picked up recently by the NY Times as clearly their other authors are just so gosh darn radical tree-hugging hippies. The Agony of the Liberals Ross Douthat, New York Times. Read this only if you want to raise your blood pressure. But this week, in The Roots of White Anxiety, he almost accidentally hits upon something important. You have to get past the obligatory conservative homage to a Pat Buchanan intro, and past some of the unhelpful generalizations, like the implicit barb that 'elite universities' are somehow unfriendly to conservatives or 'Red America', to see it. But it's there. He lays out in black and white the challenge confronting our body politic. Our system of higher education represents the class divide rocking our society, morphing from institutions of equality and meritocracy to places designed to amplify and harden socioeconomic status across generations. Working class Americans of our rural and urban communities have at some points in our history worked together to achieve progress. Much of the unfolding of the past few decades has been efforts to break these two groups apart, to create as much tension and hostility as possible to prevent them from working together. That's essentially why the culture wars were fought: not just to get Republicans fired up to oppose those Godless commies, but also, to get Democrats to relate less to all the racists who live between NY and LA. The culture wars themselves are largely irrelevant now (sorry boomers, but most young people really don't care much about petty things like skin color or abortion bans or the evils of homosexuality). But the remnants of the culture wars are all around us, in the increasingly separate worlds inhabited by various socioeconomic classes. Lack of familiarity breeds distrust and undermines cooperation. Not on purpose. But just because we're more comfortable with stuff we're around, from ideas to people. The outcome is class stratification, and looking at the demographics of admissions to top universities gives a great empirical insight into the larger trend. Rev. Billy Joe Shaw...was the beloved husband of Diep Nguyen; loving father of Tim, Dan and Ian; dear son of the late Wendell and Jennie Mae Shaw; brother of the late Bobby Lee Shaw; and uncle of Jessica Lane. In lieu of flowers, donations in memory of Pastor Bill will be appreciated for the Appalachia Service Project, collected by ORUMC. Arrangements by Ahlgrim & Sons Funeral and Cremation Services, Schaumburg. For information, 847-882-5580. "Well if he's such a student of history, has he not understood that, you know, that's the one thing you don't do is engage in a land war in Afghanistan," [x] says of the president. "Alright? Because everyone who has tried over a thousand years of history has failed. And there are reasons for that. There are other ways to engage in Afghanistan without committing more troops." [x] also described the situation around the resignation of Gen. Stanley McChrystal as "very comical." It wasn't someone from Code Pink or the Green Party either. It was this guy, Chairman of the Republican Party. I'm so confused. Nebraska has moved to the Big Ten and I don't know who to root for. Oops, I mean, Democrats have replaced Republicans, and now I don't know whether the good guys support a military occupation or think having troops in central Asia ranks on the stupid ladder somewhere between bungie jumping without a cable and putting your hand on a hot stove to recover from frostbite. What does it mean when the Bush/Cheney folks and the Obama/Biden folks both think that the head of the RNC is an idiot - when he happens to spout something with a hint of sensibility to it? Help! There's been conference realignment but no one has printed the new media guides yet about what rivalries I'm supposed to care about and who's on which side. Is Liz Cheney the new Adult in Charge? Has Bill Kristol been right about war all along? It’s simply unconscionable that Michael Steele would undermine the morale of our troops when what they need is our support and encouragement. Michael Steele would do well to remember that we are not in Afghanistan by our own choosing, that we were attacked and that his words have consequences.